FAQ: How do I find full-text scholarly articles in my subject? Scholarly material is generally available in subject-specific databases that include journal articles, conference proceedings, and related material published in related disciplines. For example, scholarly articles in economics can be found in a database called EconLit, and health science literature is available through PubMed. You can also search for scholarly articles in UW Libraries Search. 1. 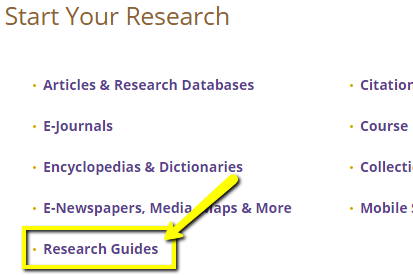 Click Research Guides on the UW Libraries homepage. 2. Choose your research subject area from the A-Z list that appears. Note that you will need to click on a broad subject category to expose more specific guide options. 3. Select the Find Articles menu option in your chosen subject guide to expose database options relevant to your research. Tip: This menu item may alternatively be labeled Articles or Articles & eJournals. 4. Choose a database and search for scholarly articles within that database. Note that clicking on a database option will open the page in a new tab. Need help searching within the database? AskUs! 5. As you browse the results, look these icons in order to access the full text of articles. Tip: Select the option located on the left or right hand side of the database to retrieve only those results that have full text immediately available. Find an article with no full text available? Find out how you can easily request it! << Previous: Who has access to resources from off-campus?